How Do Flush Toilets Work? Poor flushing power in your toilet makes flushing all of the waste out of your toilet a difficult if not impossible task. If your toilet is not flushing with enough pressure to expel all of the waste and water out of the bowl, you must first determine the cause of the problem before you can engage in a solution. You may be able to make some simple repairs, thus saving yourself the time and money spent on removing the old toilet and installing a new one. Poor flushing pressure may be due to clogs in the drain or ports. Fill a large bucket with cold water and pour it into the toilet's bowl rapidly. Do not use hot or even warm water as this may cause the bowl to crack from the sudden temperature change. 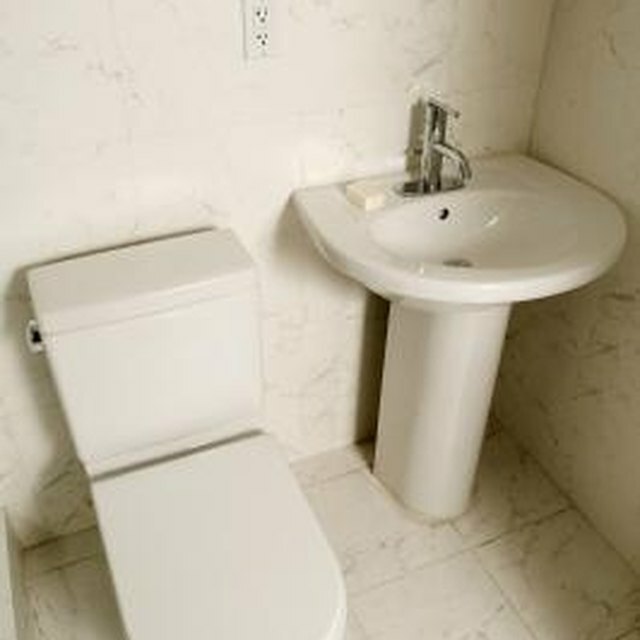 If the toilet flushes easily with the right amount of pressure, the problem is due to clogs in the toilet's ports. If the toilet still struggles to flush with the correct amount of pressure, a clog in the drain line is the problem. Before you begin looking for a clog in the toilet's drain line or the ports, looking at the manufacturing date of the toilet may give you insight into why your toilet does not flush with enough pressure, especially if you encounter the problem regularly. Remove the toilet tank's lid to see the manufactured date on the inside of the tank. If your toilet was made between 1994 and about midway through 1997, it is a first generation low flow model. No matter what you do, your toilet will not flush with the same amount of power as other toilets, according to master plumber and home improvement expert Tim Carter. Replacing the toilet with a newer model will give you less problems with flushing pressure. Clear out mineral deposits from the small port openings under your toilet's rim using a wood skewer. Manually cleaning out the deposits may take care of only the deposits you can see from inside the toilet bowl, while other deposits deep in the port passageways still remain. Mix one part muriatic acid with 10 parts water in a bucket, and then pour the mixture down the overflow tube in the toilet's tank. This will clear out the rest of the mineral deposits keeping the water from flowing from the tank into the bowl at full force. Drain clogs form when you try to flush too much waste down the toilet at a time, or when you flush objects other than human waste or toilet paper down the drain. A funnel-cup plunger helps apply pressure to the toilet's drain line, hopefully dislodging the clog so the water can flow through the drain line freely again. If a plunger does not free the clog, you must feed a toilet auger's flexible line down the drain. The auger has a curved hook on the end that either bores through clogs or pulls them out of the drain. How Does a Commercial Toilet Work?